Five. 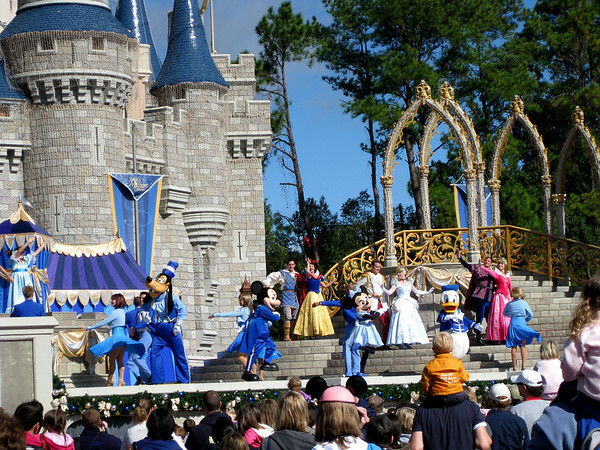 Five full, action-packed days were spent at the four different people-packed Disney theme parks (Magic Kingdom, Animal Kingdom, Hollywood Studios and Epcot). 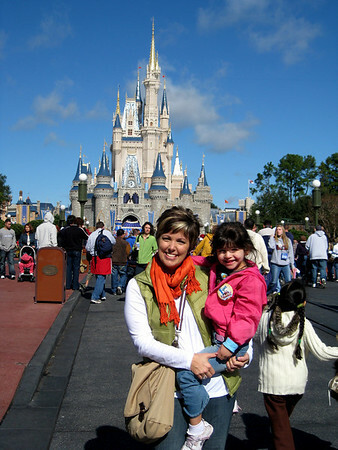 By far, Magic Kingdom was our favorite. 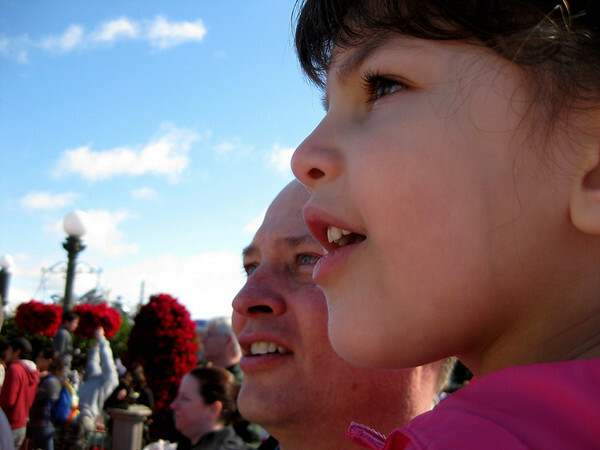 I had visited Disney World before with my parents. However, I can't say I had the best experience because I was, hello, a moody teenager with her parents. Plus the fact that my dad crammed Disney World and Epcot in like two days. I am thankful we had plenty of time to visit most of everything we wanted to on this trip. And that I'm no longer a teenager. We won't discuss the moody, okay? Magic Kingdom had it all, rides, shows, characters, parades, fireworks. I'll admit, there is some magic happening there. Especially if you are five. One of our favorite things to do was getting character autographs and pictures. We bought Annelise the basic WDW autograph book and she LOVED keeping track of her signatures. The characters were wonderful, very friendly and playful. Most of the lines were not too long and well worth the wait. Especially if you are five. 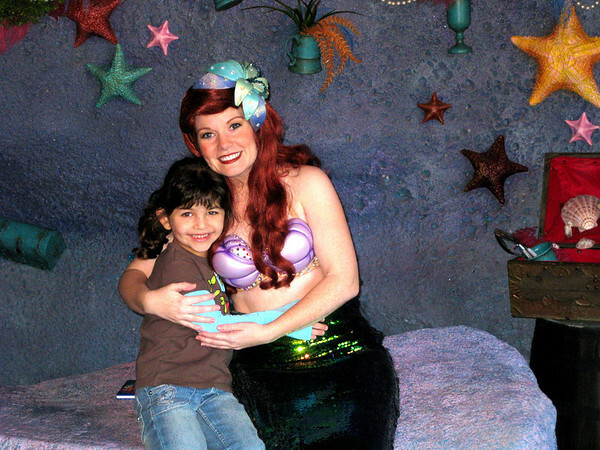 The longest wait was for Ariel, taking close to an hour to meet this scantily-clad mermaid. In her grotto there is a play area for the kidlets and a comfy wall for parents to sit. Since there was absolutely NO WAY we could skip meeting her, we sucked it up and waited. Over the course of our stay we managed to get autographs and pictures with most of the characters. There is of course a fine line between fan and stalker. Especially if you are an exhausted five year old. 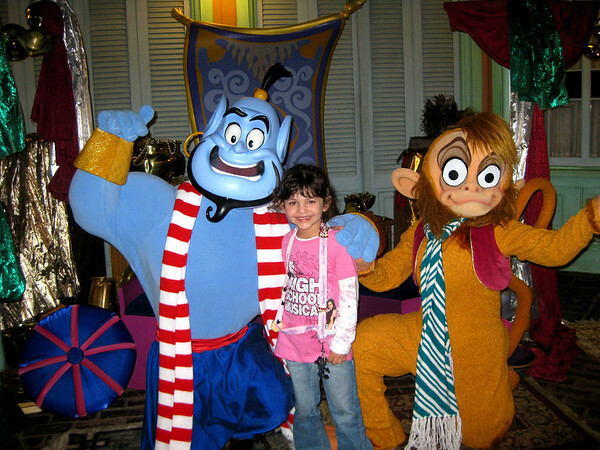 One night we stumbled upon Aladdin and Jasmine over in Adventureland just as they were ending their autograph session. A. was crushed. They said they were off to ride the magic carpets. So of course we follow. 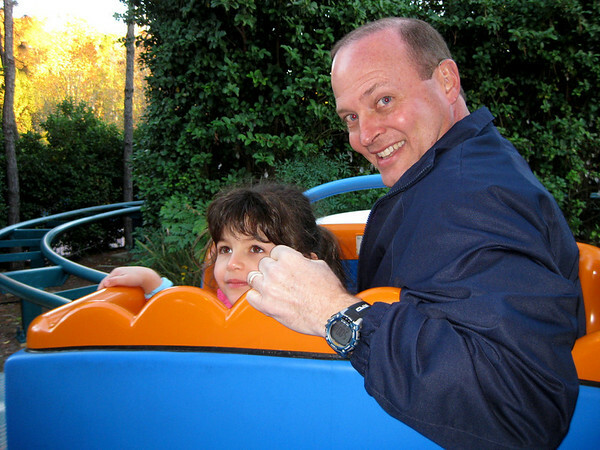 A. was crushed again when she realized Princess Jasmine was riding the ride with another little girl, not her. After the ride she tried to give Jasmine a hug, and demand in exasperation why she didn't ride with her. Princess Jasmine was very sweet, but she and Aladdin had to hurry off. By this time, A. was in angry tears and was verging on being issued a restraining order. Disney does everything well, especially their parades. There is something so compelling about characters dancing down the street or riding in unusual vehicles, you can't help but angle for a good spot along the curb to watch. This was the afternoon parade at Animal Kingdom. 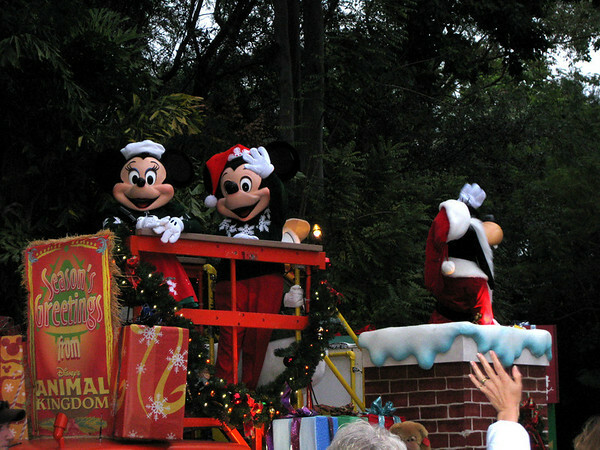 We also watched Mickey's Holiday Party Parade and SpectroMagic at Magic Kingdom and the Block Party Bash at Hollywood Studios. We also discovered that our little five year old is possibly an adrenaline junkie. 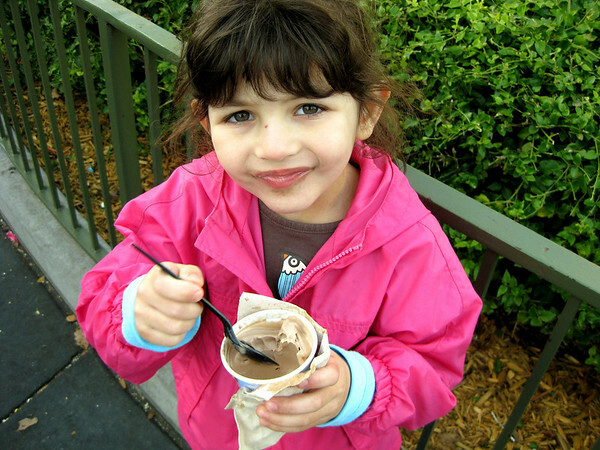 After her first rollercoaster ride, Goofy's Barnstormer, she was hooked. Her favorite ride was Big Thunder Mountain. Space Mountain was closed and she wasn't old enough, tall enough or brave enough (yet) for Expedition Everest (AK) or Rock-n-Rollercoaster (HS), but I see many more rollercoaster rides in her future. She loves a thrill. 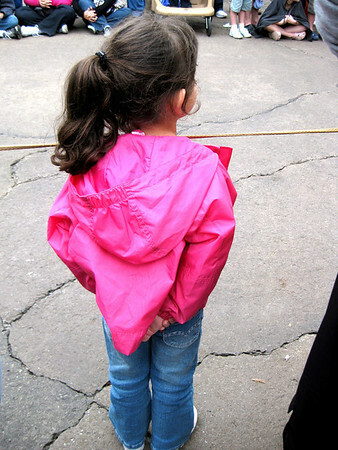 Theme parks seem to bring out either the best or worst in people of all ages. Crowds, lines, sleep deprivation and over stimulation can wreak havoc on our dispositions. Taking a break, regrouping and shaking off the frustration works wonders. Ice cream doesn't hurt either. Stay tuned for more memories and some lessons learned. Oh I love Disney World!!!! My girls keep asking to see Ariel again, so I have to keep this comment short. BUT I'M SO JEALOUS! Looks like you had a great time. It's so cute that she was so into getting the characters' signatures. My kids were never into that so when we went to Disneyland 2 years ago it was all about the rides. Magic Kingdom is my favorite park too. We spend much of our time doing autographs there as well. Looks like you guys had a ton of fun! Especially the five year old! :o) Wow, what will it be like to take 5 kids? hmmmm.... do I need to rethink?? Oh Holly! What fabulous photos!!! I love the one of Scott and Annelise in awe at the parade. Can't wait to hear more! It sounds like such a magical time! The pictures are so beautiful...The K-man has looked at the pictures several times! He is saving up for his trip someday! I am glad to hear that part about "moody teenager" in your past...we took one of those this year... it does indeed bring out the best and the worst in folks of all ages!